GLP-compliant meter with pH, ORP, or ion concentration capability is perfect for water, wastewater, or food applications. 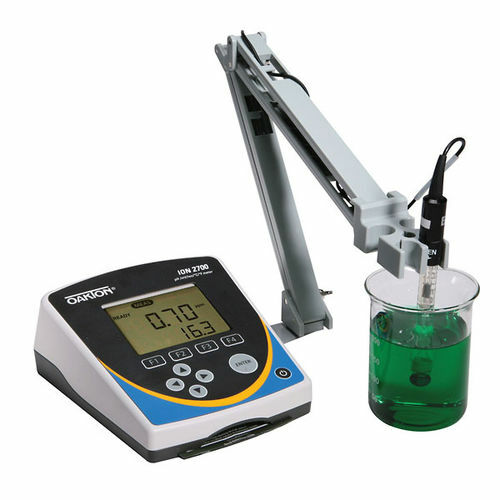 The Ion 2700 meter offers a new compact design that is over 40% smaller than other benchtop meters. The large display is easy to read even at a distance and features stability indication. All measurements include temperature display. The meter includes auto-buffer recognition for both USA and NIST pH buffer sets, automatic or manual temperature compensation, temperature in °F or °C, and display Hold. A calibration due alarm function means no more out-dated calibrations. The water-resistant membrane keypad offers password protection for both set-up and calibration.